IS IT HELPING OR HURTING? : The All-Star/Mass Band – Block Us Up! No this article is not a “let’s beat up the Mass Band” post. It’s an attempt at starting a discussion about something that I, admittedly, may have the wrong understanding of. I’m currently a resident of Houston, Texas, but like many in H-Town, I am a transplant from another region of the country. I am a new arrival from the state of Georgia by way of South Carolina, and through the halls of a MEAC school by way of a corp style high school. Since there are just a handful of cities where this is “a thing”, my experiences with All-star/Mass bands have been limited to what has been posted on youtube and discussions I’ve had with band directors who teach in cities that have All-Star/Mass Bands. These discussions, with both college and high school directors, are surprisingly varied in critique. Band directors are used to getting a good return when their students participate in additional ensembles. Usually it’s an honor band or a college band camp and they can see the immediate growth in their students when they return. However, the All-Star/Mass Band has had the opposite effect in the minds of many directors. Their students return to their campuses with bad musical habits like breaking phrases, overblowing, and over extending their instrument’s tessitura by “taking everything up”. Some directors feel that All-Star/Mass Bands are damaging the culture of HBCU bands similar to what the “Lil’ Rappers” are doing to hip hop. All this done as loud as possible. This article is in no way an indictment of All-star/Mass bands. I’m hoping that through level – headed discussion, we will all learn something about these bands and the mass band culture. In your opinion, are All-Star/Mass Bands hurting or helping high school and college bands? Do you believe summer band camps have suffered due to the popularity of All-Star/Mass Bands? Is this a fad that will pass through or is the All-Star/Mass Band here to stay? Drop your vote in the poll and participate in the discussion below. Pingback: SUMMERTIME IN THE CITY: Band Camps Or All-Star/Mass Bands… The Revisit – Block Us Up! I would love to do an interview about this article on our show choppin it up on the marching podcast radio network. Great article and good conversation below. Great job and I Hope to hear back from you guys. I like to mention the connection involved. In mass bands, student play with people they maybe otherwise never get the opportunity to play next to each other. I graduated Riverdale High in GA, marched with Mighty Marching Hornets at Alabama State, and participated a little with the Georiga Mass band. I got friends who reach all over. 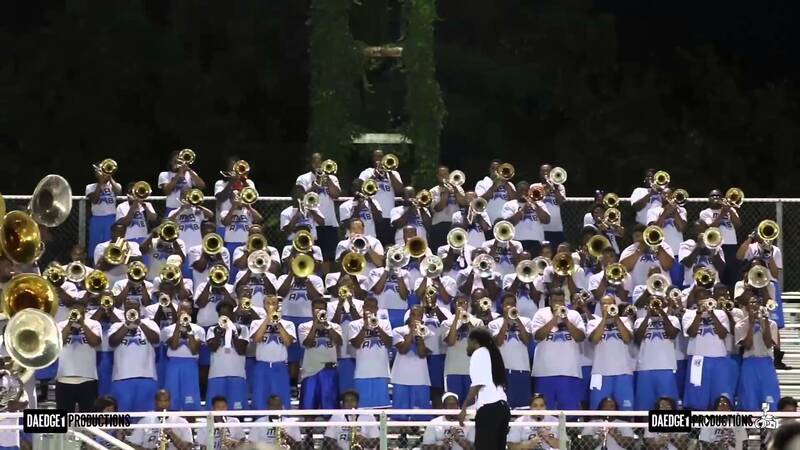 Some direct their own school programs, others recruit for their colleges, many inspire students to grown their talented and a few even organize mass bands. The programs are a service to our community. The only thing is to recognize these bands are like recreational sport leagues. The atmosphere is more relaxed but fundamentals are still in place. That is awesome! I consider this to be of high importance due to the fact that band is so “regional” nowadays (Every area has a different style and approach) It’s very important to see and experience what others are doing in the craft, It will only make students have a more diverse musical background. GREAT POINT! Unfortunately the internet has way more of a negative effect on these younger musicians. The over blowing and hanging over isn’t pick up from “Allstar” bands, they are hearing it on youtube. I neither like it or hate it. I see the good and bad. I agree the internet is a blessing and a curse. It brings our community “closer” but in doing so exposes our students to the good and the bad. Ultimately it all comes down to the standard that the director sets, though reteaching material and redirecting wayward students can prove quite time consuming and unfair to those who follow progam norms and procedures. One consistency we have in all cities that participate in the Summer all-star/mass bands is poverty , drugs and homicide. We are keeping kids off the street. I lived in Houston for 7 years so I am very familiar with HUMB & MMB. Kids get audition opportunities and a chance to play with students from their favorite programs. Most directors who don’t approve of massbands are usually bitter toward the directors over the program. If your student comes back with qualities you don’t like fix it. It is much easier to tame a beast than to teach how to be a beast. My high school director told me that years ago. I agree that students who are in need of redirecting will get it from the director. Most students require a period of refresher training at the start of the season anyway. Yeah that makes a lot of sense. An opportunity to have a lil fun and let loose. Nothing wrong with that at all. We never had them in my area I think I would have enjoyed it as well. Thanks for the comment! You speak about the characteristics of musicianship that you say these bass don’t teach. Not all players have the same ability and skill in all of these groups. Some are better than others. The one thing you didn’t mention is that is these groups give kids the motivation to want to get better on their instrument, and practice. Even good players need to practice and master all the techniques of their instrument. These college band directors need to get a grip because these bands feed their programs. Competition makes a person better. I think you have the wrong idea of what these bands to for children in the community. I’d rather see them in an all star or mass band than reading about them being on television for a crime. I say let the bands continue to do what they’re doing. They entertain crowds often better than a lot of HBCUs. I’m all for them. Great points! I agree that college band directors may need to explore how this phenomena could be more helpful from their perspective. Recruitment is definitely a way to bridge the divide and make the relationship more advantageous for all parties!